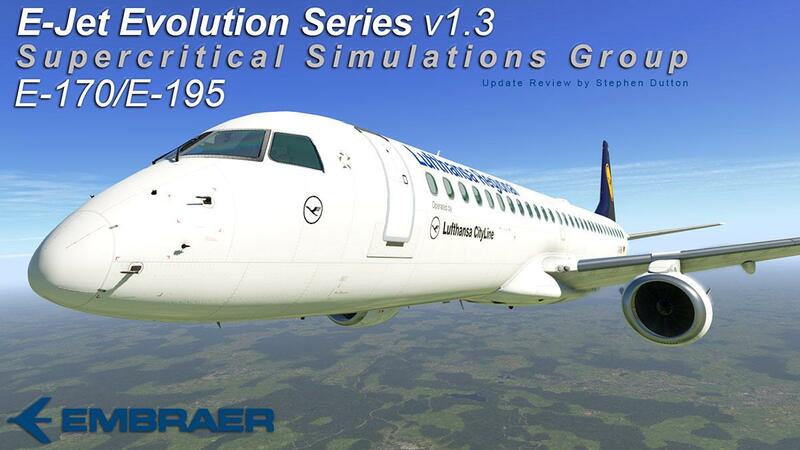 Supercritical Simulations Group have updated their E-Jet Evolution Series to v1.3. 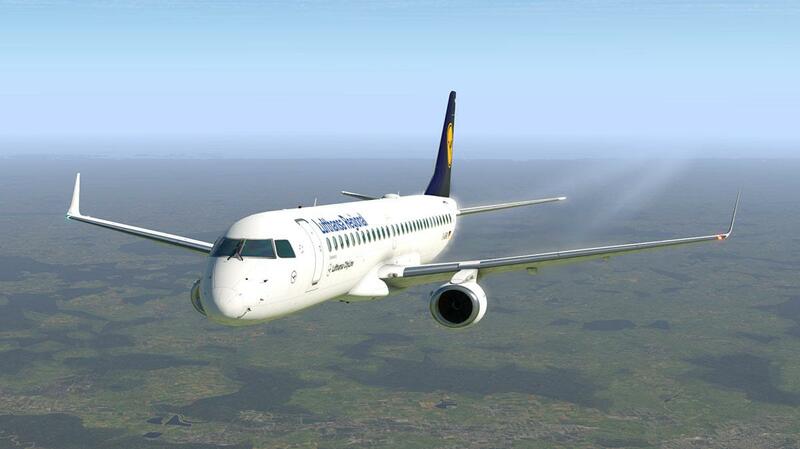 This includes both aircraft of the E-170 and the E-195 variants. 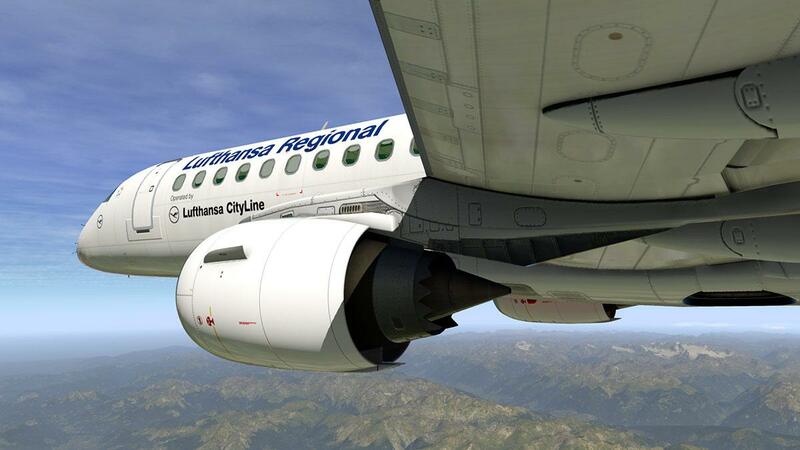 Note all the details noted here relate to both aircraft E170/E195 and the combination package of both aircraft in the "Series" pack. 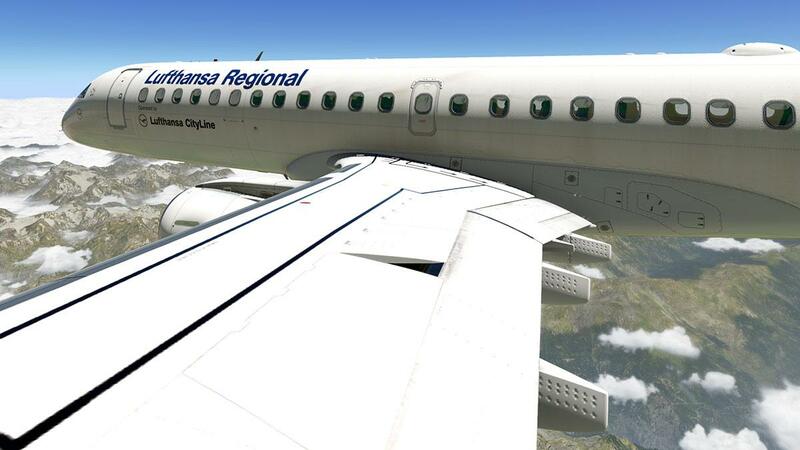 Regional airliners are all the rage for time poor simulator users, the routes are short detailed and will fit into any two to three hour flying window. 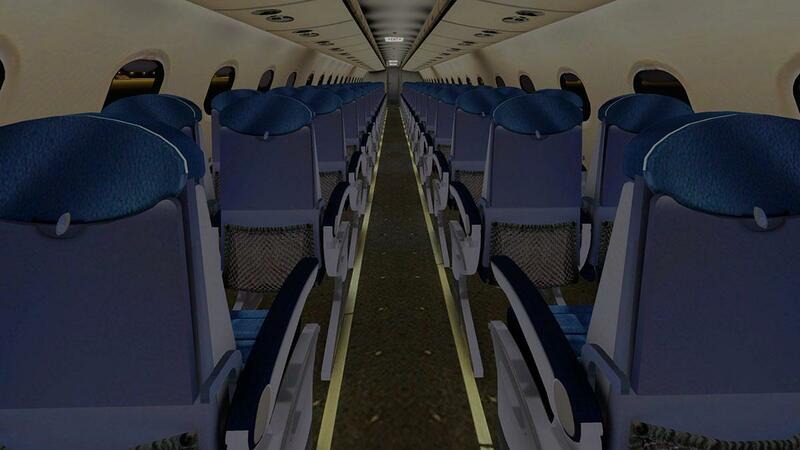 Propeller regional aircraft are the most used, but sometimes you want something different, even a bit faster... a jet. 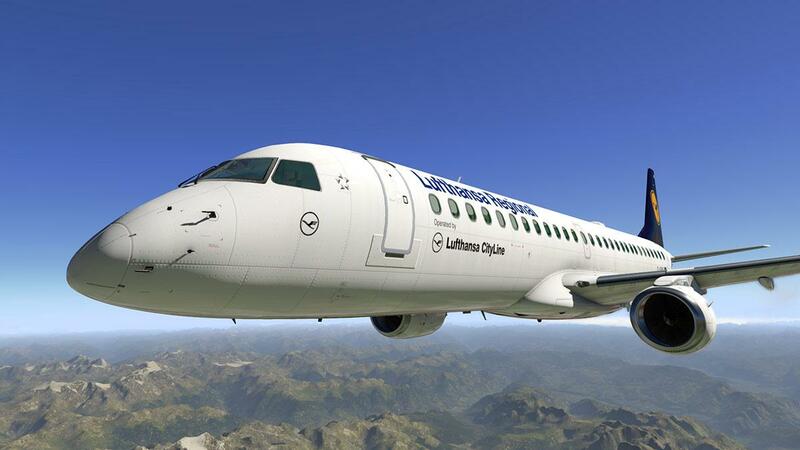 There are two main regional jet manufacturers, one is Bombardier CRJ (Canada) and the other is Embraer EJet (Brazil). There are two developers that cover the E-Jets with one being X-Crafts and the second in SSG with their E-170 and E-195 variants. 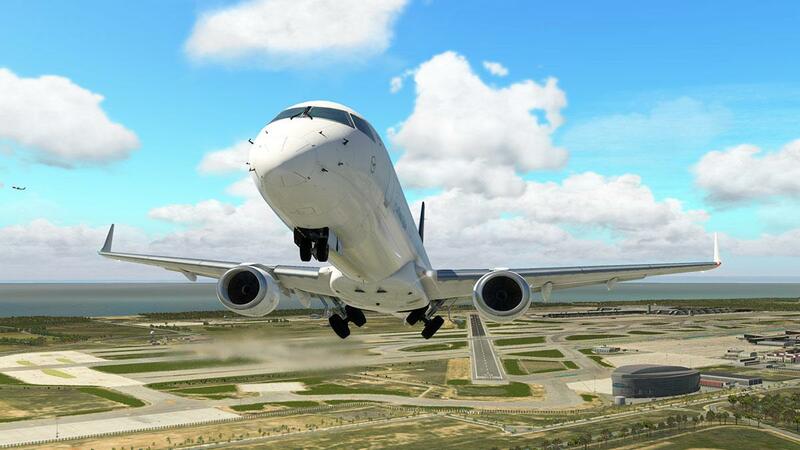 This update covers the X-Plane 11.30 performance update (noted as v11.32) and a few VR (Virtual Reality) fixes. 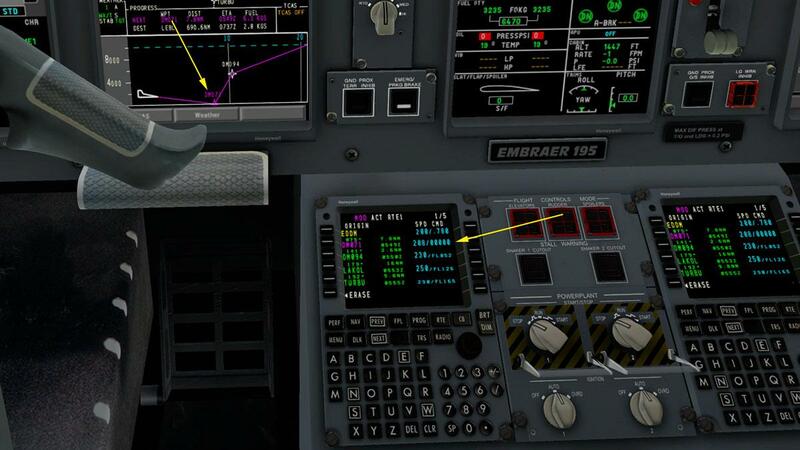 Adjusting the V/S Vertical Speed now is a nightmare of hair pulling proportions... trying to get just 100 digits between descent or climb settings is one for the real nerve testing conditions... so could we have scroll please? adjusting the Baro is a lottery of either STD, or IN but no hPa. BARO minimums have however been implemented. 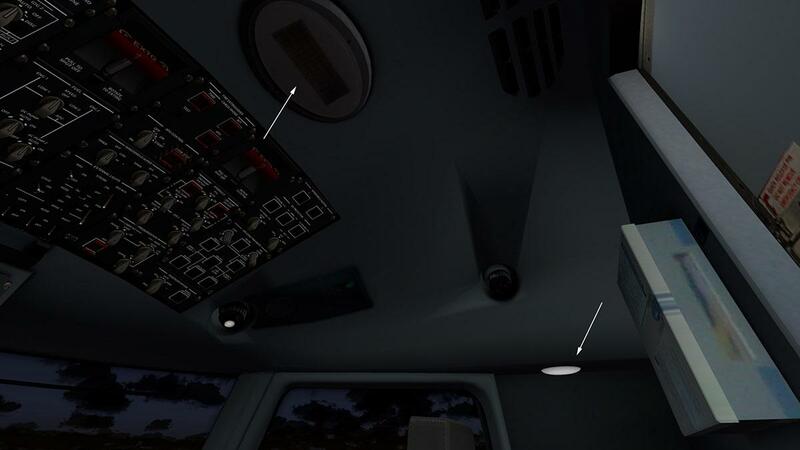 .... both pilot "CHART" (adjustable) lights give a nice touch per side (above right). The confusing lighting setting is the side panel FLOODSTORM knobs... they actually adjust the panel LED dropdown lighting? they however do give the cockpit that modern LED lighting effect very nicely. The (real) FLOOD switch is up on the OHP, that switches on two rear roof lights and they look good and work well... however the central roof mounted (FLOOD) light is dark? 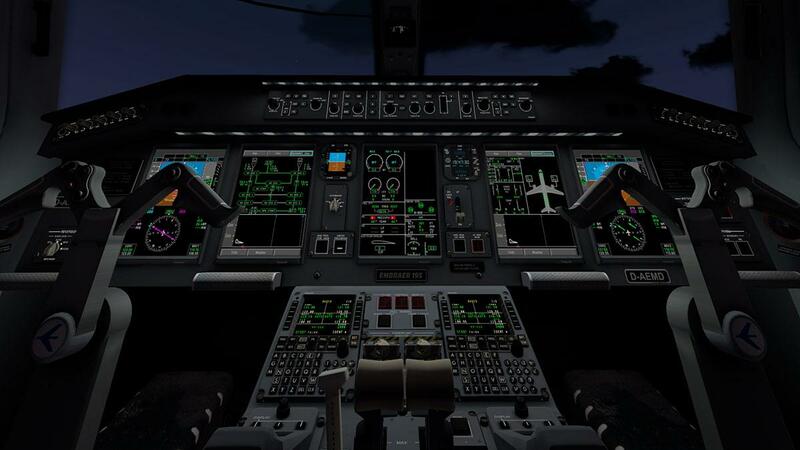 Overall though you can find all your comfort settings for on the ground flight set up, mid-flight and approach situations. 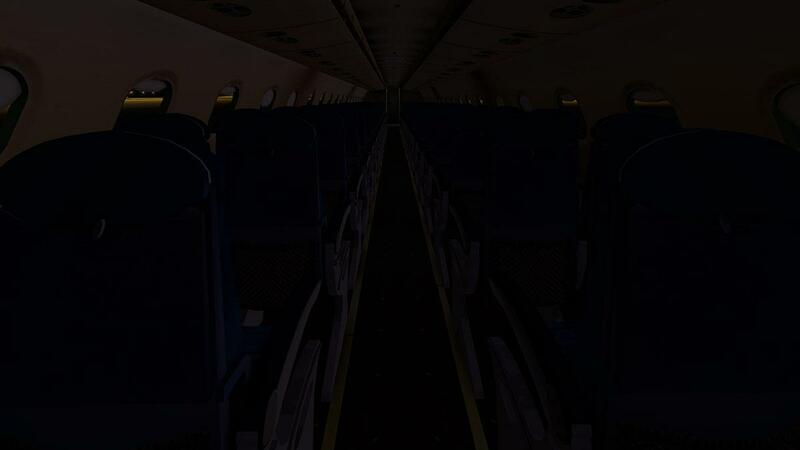 The cabin lighting is still separately adjustable... which is very nice, but the cabin is now starting to feel a little or very dated in the E-195, but the grey trim in the E-170 is far better. The TRS Pages has had the most attention here. 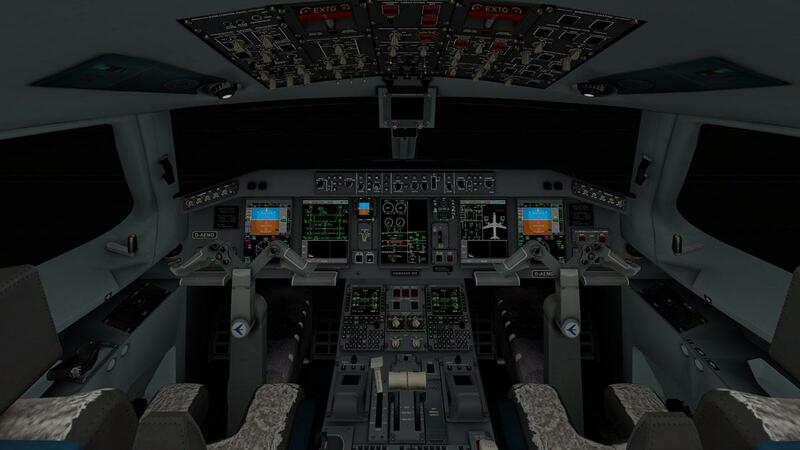 These are settings to select the best takeoff "Thrust Rating". The default is the AUTO setting, but you can select a TRS setting that you require and that then becomes the default AUTO setting, and you can have the FLEX option ON/OFF, and bugs were addressed to include fixing the links to the TRS Page. 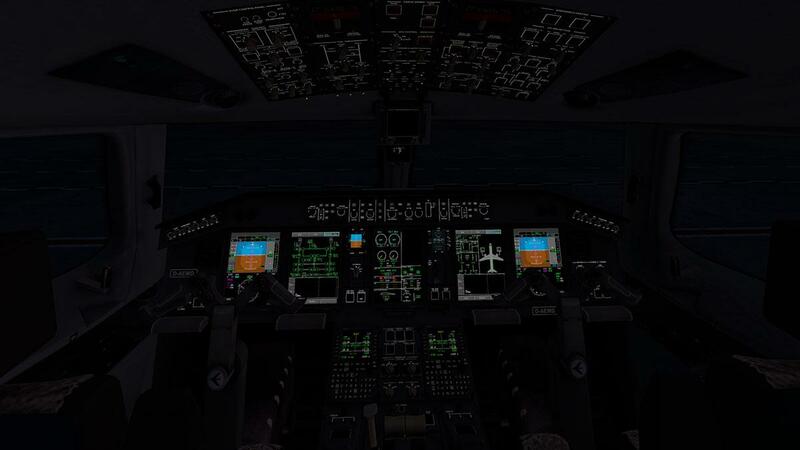 You now have RNAV approaches and the old foe in TOD (Top Of Descent) is now better computed and the RF legs type is now added to SID/STAR/approach procedures. You can add in your current aircraft's tail number which is nice... but the TN change is not reflected elsewhere in the FMS? .... if you are good and understand the FMS setup well, you can usually easily edit it out, but sometimes it won't let you, so a complete clean INIT restart is required, like I said I didn't get this with AIRWAY input? These coloured routelines have had attention in v1.3 to eliminate them, but in certain cases they still persist... I did find however the more you constantly use the FMS the more the system behaves correctly.... but as the images show, they still can cause the odd editing issues. ... and so initial the waypoint altitude is always out? 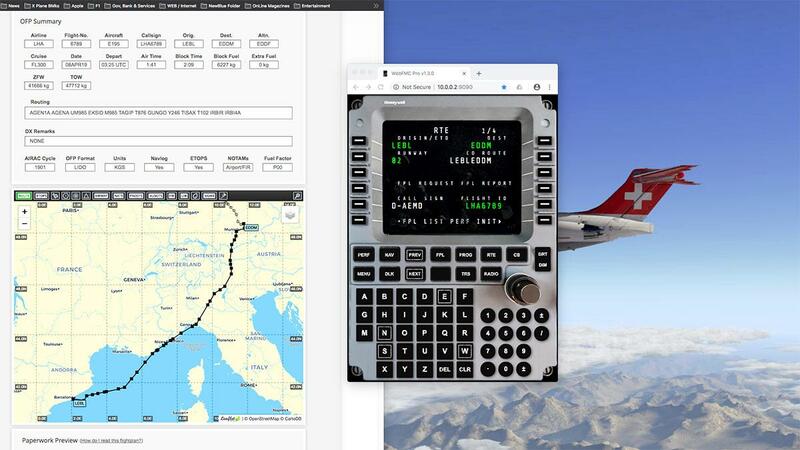 At LEBL (Barcelona) that is not too much of an issue at an elevation of 14ft, but when I set the FMC at EDDM (Munich) of which the airport is set at an elevation of 1487ft, then you get a massive dip in the VNAV flightplan? and you can't adjust the setting either to correct it? 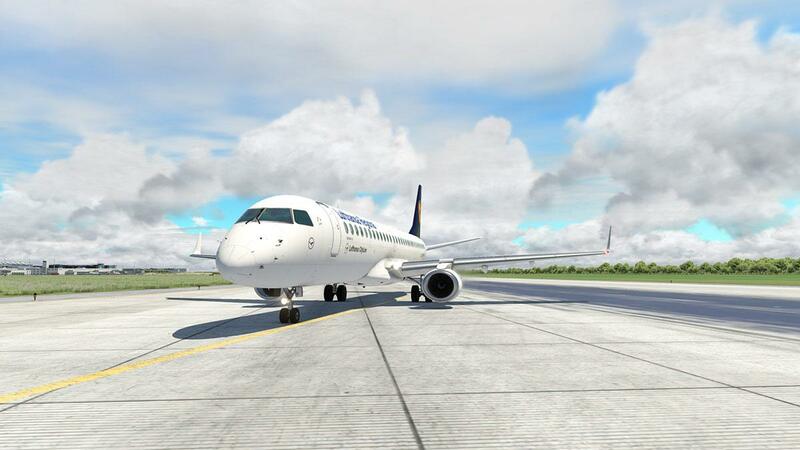 The popular add-on plugin WebFMC is now also available for SSG aircraft including these E170 and E195 aircraft, the WebFMC version required is v1.3.0. A huge favorite plugin of mine is a huge bonus in programming the E-Jet routes and performance. 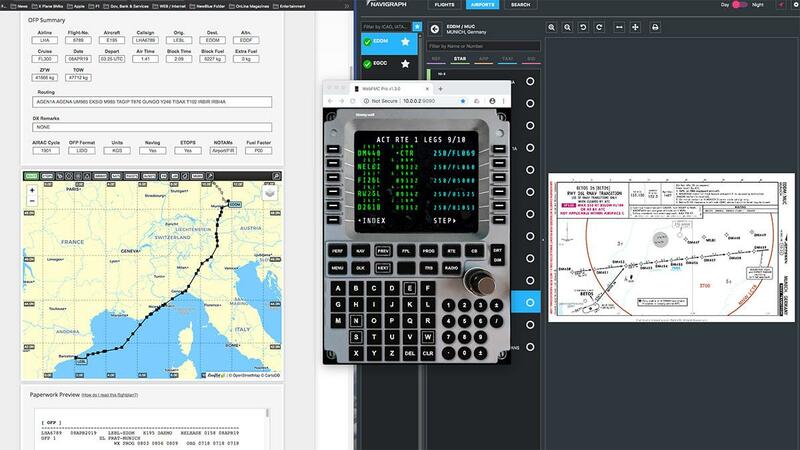 Somehow I found the layout of inputting the route data into the WebFMC far easier than directly and even with the pop-up FMC (Key F8) in the aircraft, it is easier to do that route editing as well. 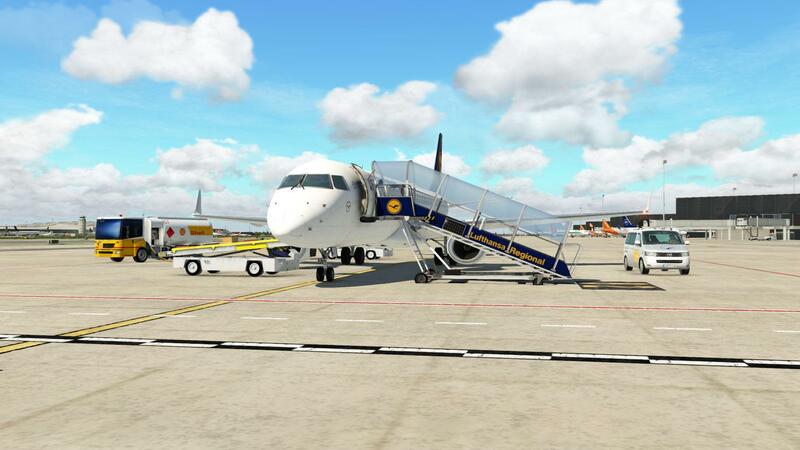 Setting up the E-195 has certainly come a long way since the first release of the aircraft and those lovely custom stairs are still a sight to behold. I still find the fuel loading a bit too constraining, as you can't have the exact amount that SimBrief notes 6227 kgs, but the nearest I could set the load was 6236 kgs. Added in now is the particle effects for the APU (Auxiliary Power Unit) outlet (below right). .... in other words it looks far better. Sounds haven't had any adjustments, so they are starting to feel their age compared to the extensive sound packages now available and no FMOD sound that is noticeable with the use of the older DreamEngine sound machine. 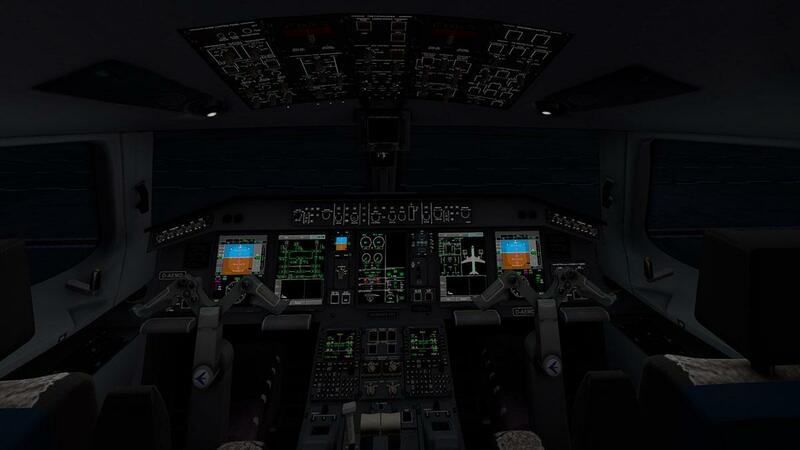 External sounds are too loud, but can be adjusted down, but the cockpit and cabin levels are too low at the high settings, in flight engine noise is slightly droney which I don't care for, but the wind noise is very good. Data FMS readout and detail is also very good, a few details in the perf, climb, cruise and descent don't fill in until the aircraft is off the runway and you want to manually fill them in, but can't.... obviously. But in the air you have a huge amount of data on a huge amount of page options, it is almost study grade in detail. 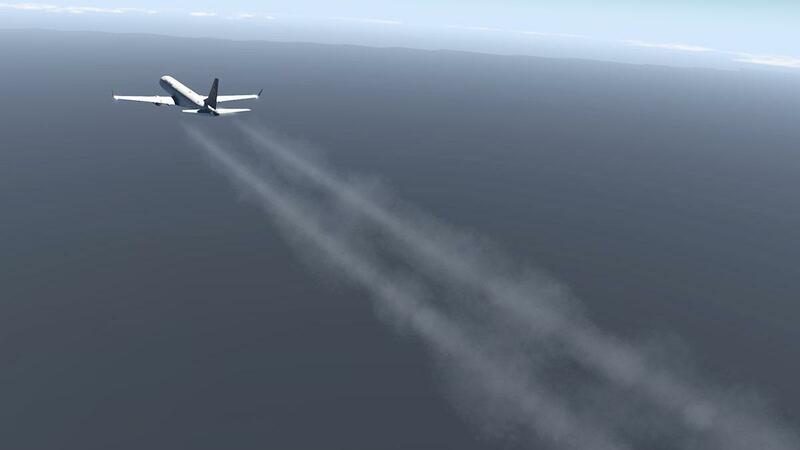 I found the particle effects from the engines and wings quite heavy, so the vapor trails look non-adjusted, which is weird when you add in the new APU effects, so why not adjust the others for the correct effects? for the small GE CF34-10E turbofans at 20,000 lbf (89 kN) each, they pump out a lot of trail. 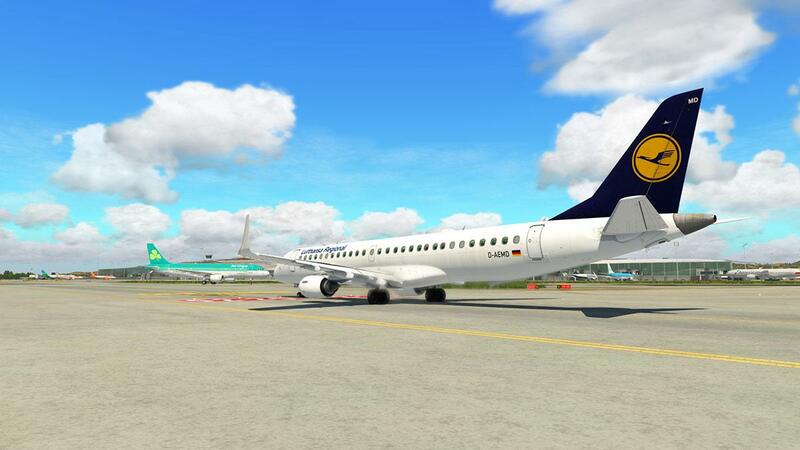 (E170 uses the GE CF34-8E turbofans at 14,200 lbf (63 kN). 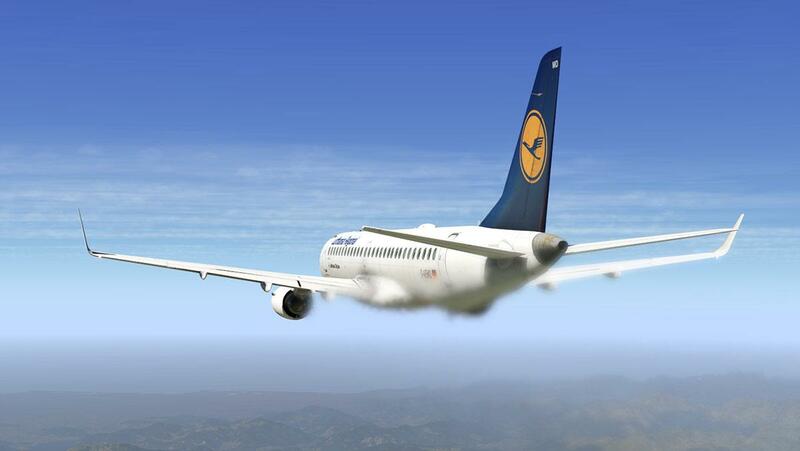 The wingtip vortices as well are not adjusted and sit trailing below the wingtips? The vertical speed profile is excellent. I like to do all my climbs and descent manually (no VNAV for me) and here you have the V/S profile and the target point of the altitude after descent. 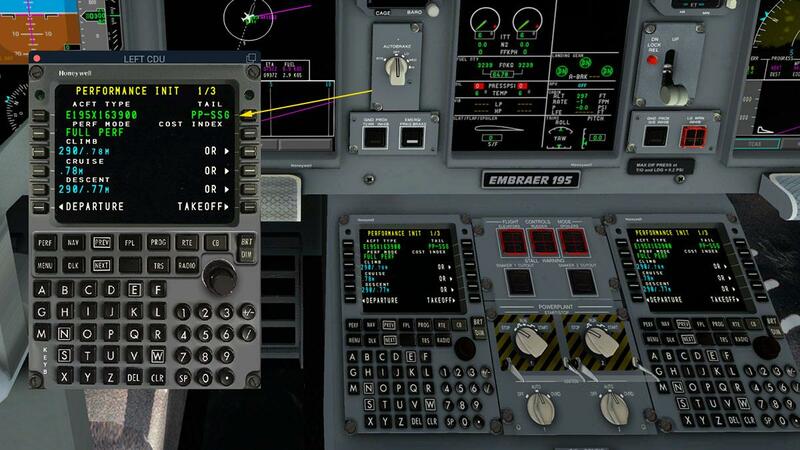 Speedbrake logic, messages and commands improved and spoiler issue on landing fixed is noted, but I found that I couldn't now use my Saitek x56 throttle switches for speedbrake actions? (Speedbrakes extend/retract one)... only a manual adjustment was possible? 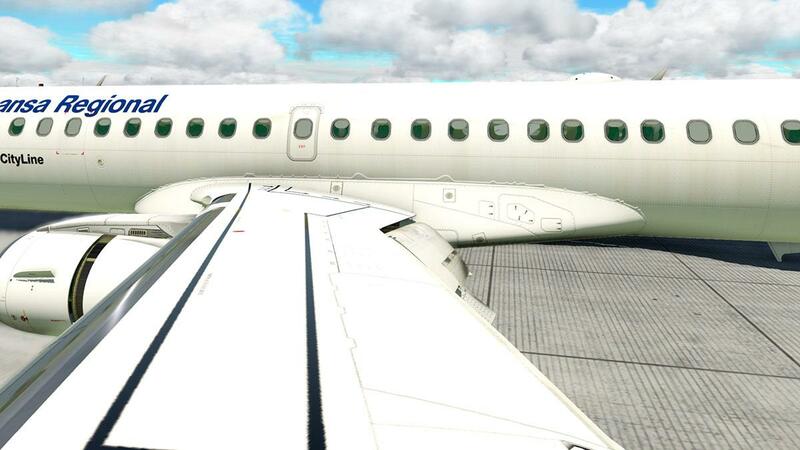 On landing at EDDM (Munich 26L) then the spoilers didn't activate either? 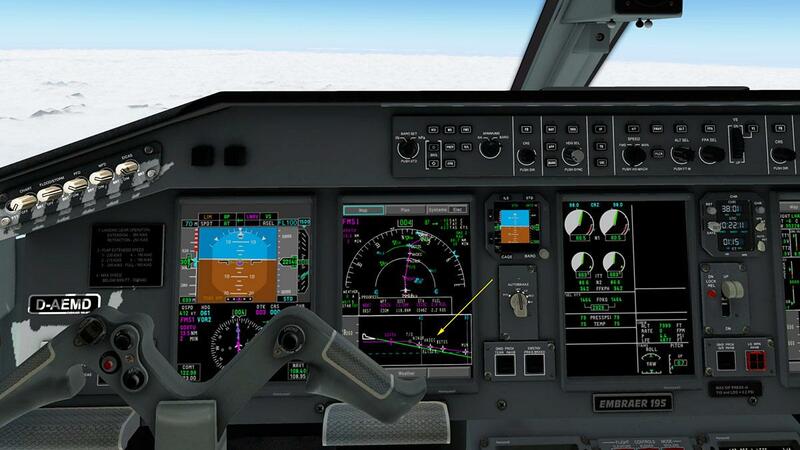 I checked through the four routes I have done with this version and each time they didn't deploy... in most cases you arm them (Speedbrakes retract one) but if that is the way to to that on the E195, I'm not sure, but as the speedbrakes actions don't work via the switch (key option) I can't check that either? Is the spoiler activation just a setting? I don't think so. EDDM and another nice flight. 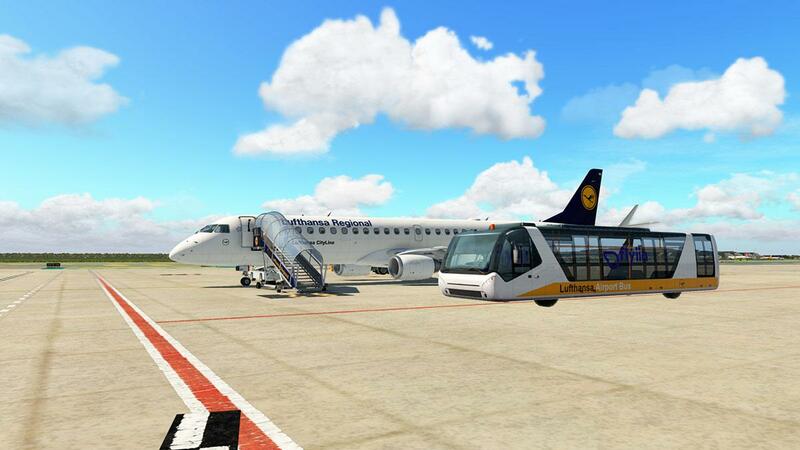 This is the 11.30 update for the SSG E-Jet Series, with both the E-170 and E-195 variants. The 11.30 performance adjustments is of course a given, and by my route numbers it is pretty good. The particle effects are a mixed bag with the addition of the APU output, but nothing else in vapor trails and wingtip vortices have been adjusted and it shows. Cockpit lighting has had a lot of attention and now very good. More to the good are the gear adjustments, flying characteristics and the general great detail and feel of the aircraft, options are quite nice as well. A huge amount of detail and adjustment is now available with the Javier Cortes FMS, overall the system is now very good and quite complex and even close to study grade, but a few quirks still are in there. 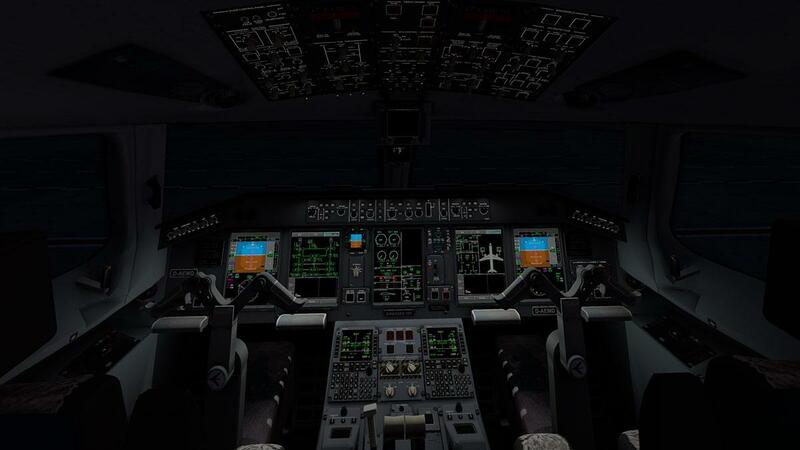 As with any FMS system in being a good route editor can be a worthy skill, so you will need to know what you are doing when filling out and editing routes... but this FMS is now light years away from the earlier versions. 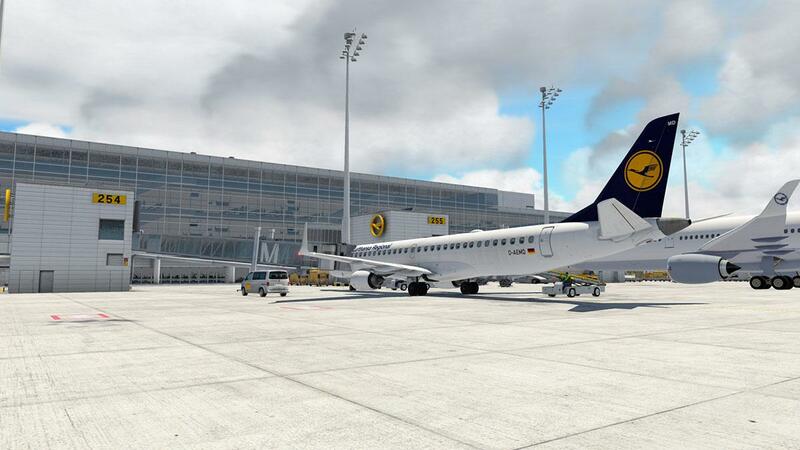 WebFMC intergration is also now available on both aircraft and another worthy addition. Oddly in areas to advance the aircraft have had the opposite effect. VR (Virtual Reality) manipulators work well in VR, but in the normal use they are now quite hard to use with no scroll option? Vertical speed adjust is simply really hard work , as are a lot of the knobs in the cockpit with only the drag option and BARO is a bit of a mess with no hPa adjustment. 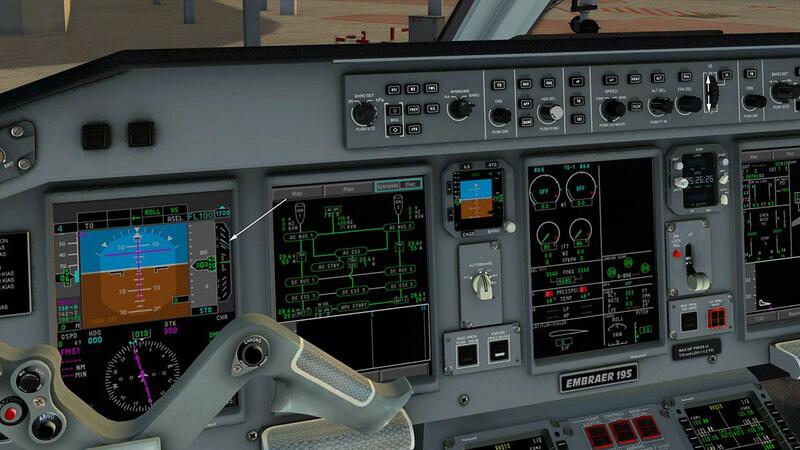 The refinement of the spoilers/airbrakes has made them worse as well, with only the manual adjustment useable. 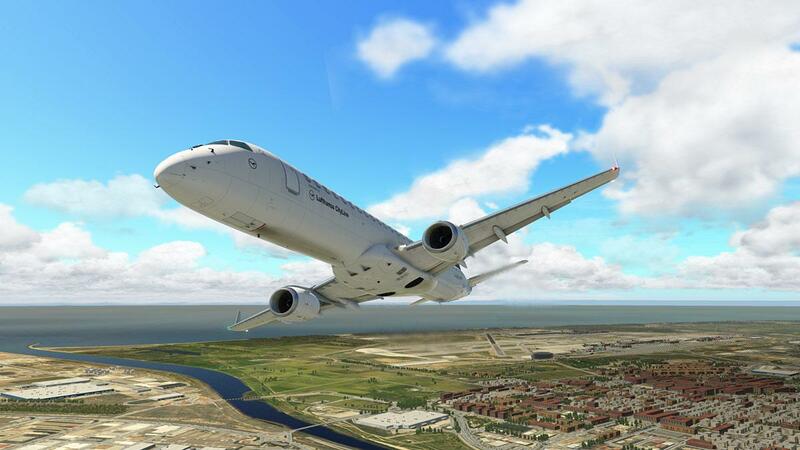 In other areas the E-Jet is feeling it's age with an outdated cabin and sounds. This is an aircraft to use highly regularly. So popping in and out of the E-Jet will mean you won't get the full aspect of the aircraft, after time and with a lot of routes you will find the aircraft comes to you as you adjust to it's slight quirks and the way you fly it as it is slightly complicated, so the more time you spend in the left seat then the more return the aircraft gives back to you and after a while you can fly this excellent E-Jet like a pro... if every aircraft in X-Plane was the same it would be totally boring, and that is the aspect of the skill to fly aircraft like these small jets well. Recommend the SSG E-Jet, yes absolutely but this is not the update to bring it totally in line with the top notch requirement of the current standards of which this aircraft could easily achieve. SIDs, STARs, transitions, approaches, flare and rollout modes. 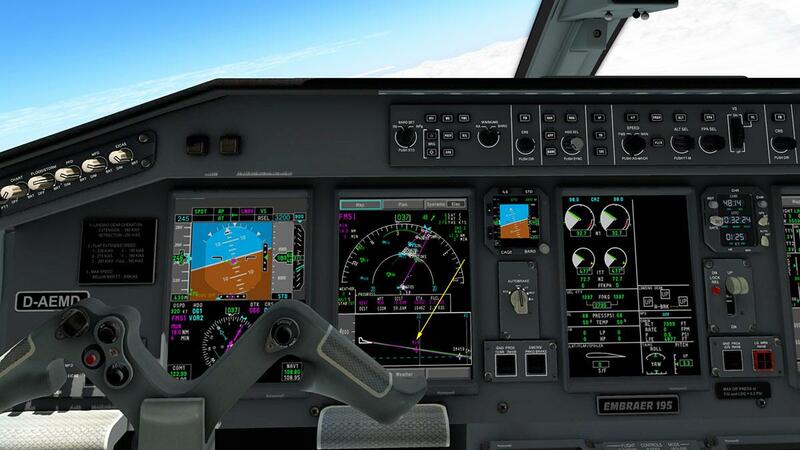 FMS is compatible with Navigraph navigation databases. Manufacturer's performance data embedded as tables in the fully functional FMS. 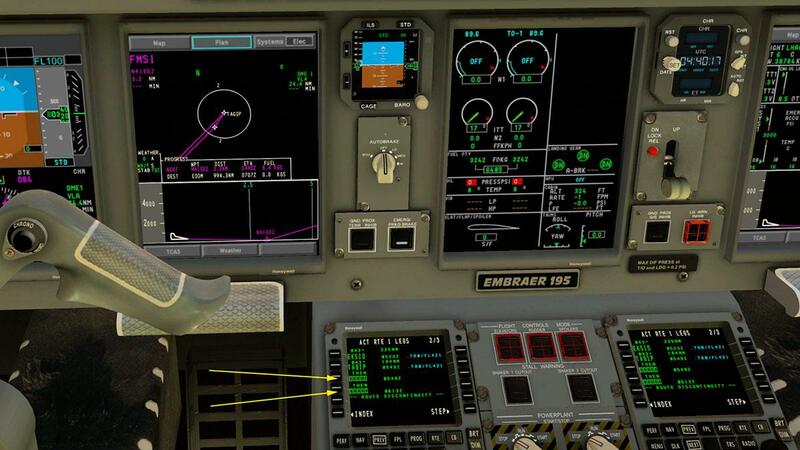 Option to use either a 2D pop-up (resizable) MCDU or one within the 3D cockpit. Radio communication audio consoles optimized for on-line virtual ATC operations. 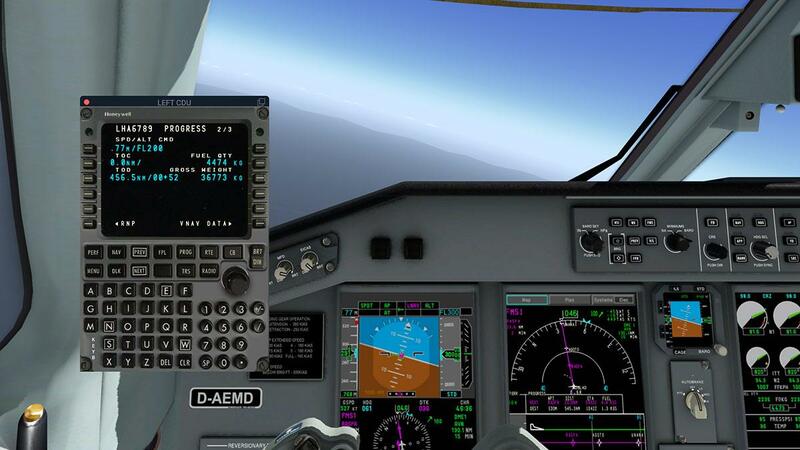 FMS performance information based on real aircraft data, including V-speeds. FMS includes capability for autotuning navaid frequencies. 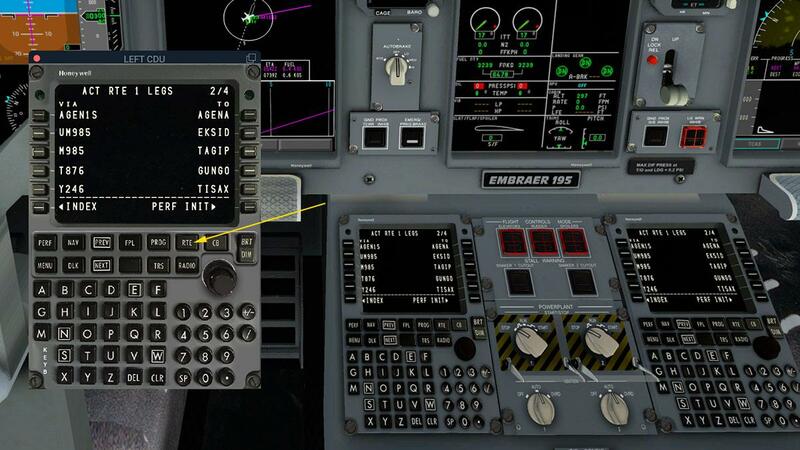 Vertical Situation Display (VSD) on the MFD, Unique in XP. Terrain display mode on the MFD, which is a part of the Enhanced Ground Proximity Warning System (EGPWS) on the real aircraft. External lights and strobes operating realistically, with dynamic lighting in the scenery. 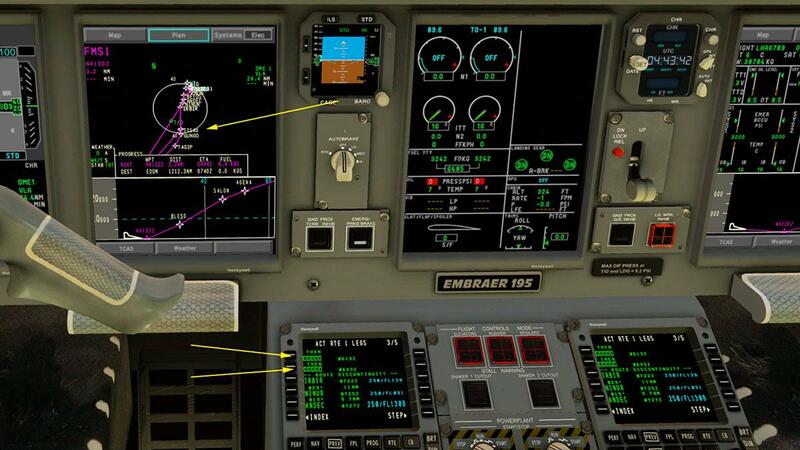 Display management similar to that in the real aircraft. Autobrakes with anti-skid system that works in all conditions and includes a realistic rejected takeoff mode. 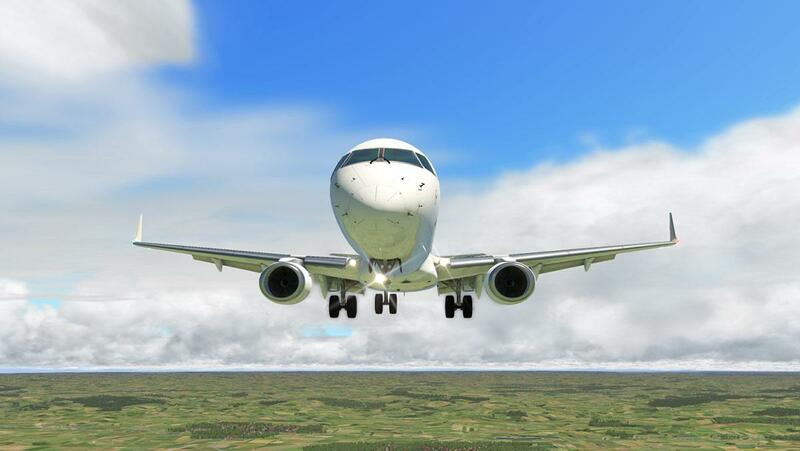 Realistic wing flex and other animations. Window rain effects and animated wipers. 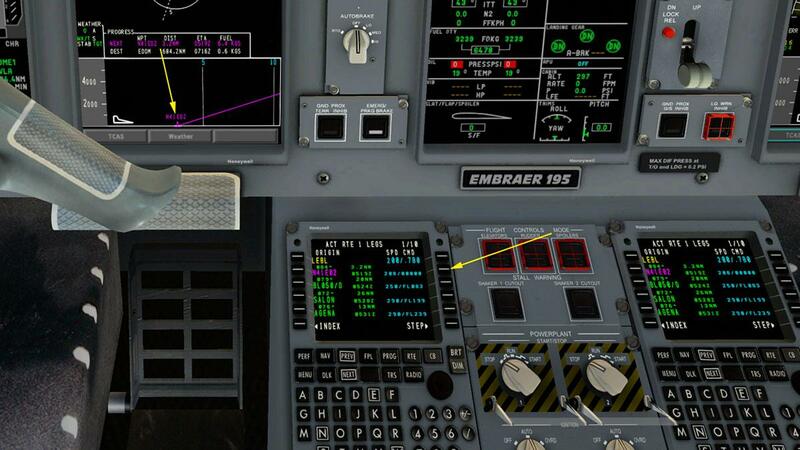 Option menu incorporated into the 3D cockpit. Ground vehicles include a tow truck, GPU and airstairs. 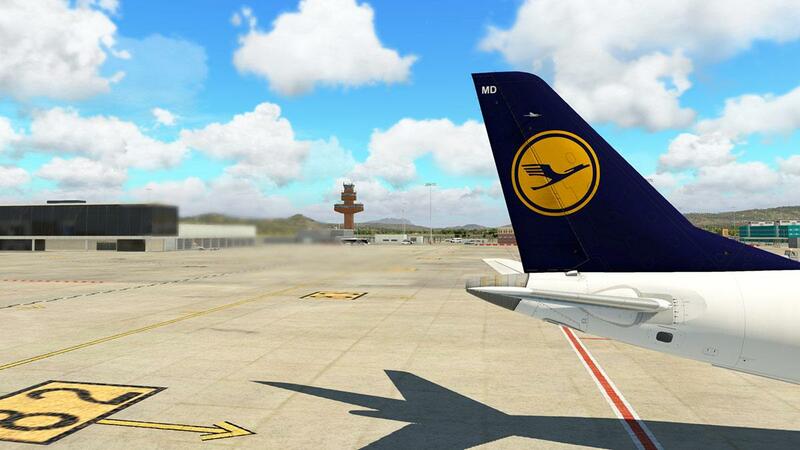 Over 10 detailed liveries come with the package. 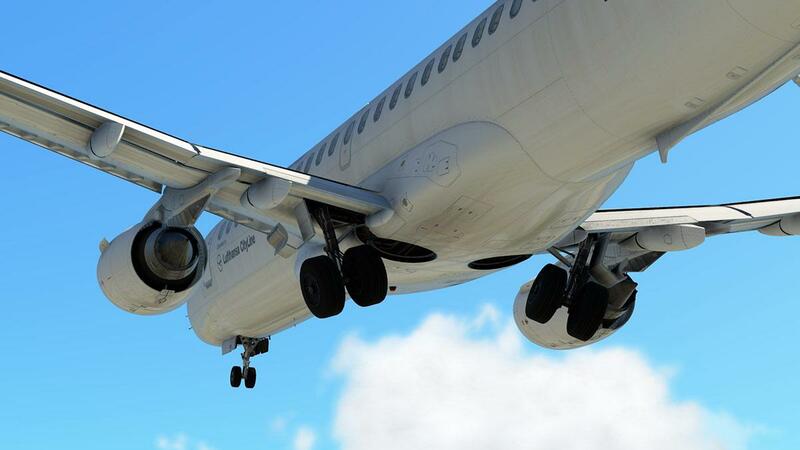 Aircraft will meet most of the real aircraft's performance data for consumption, AOA, speeds, flight dynamics, etc. 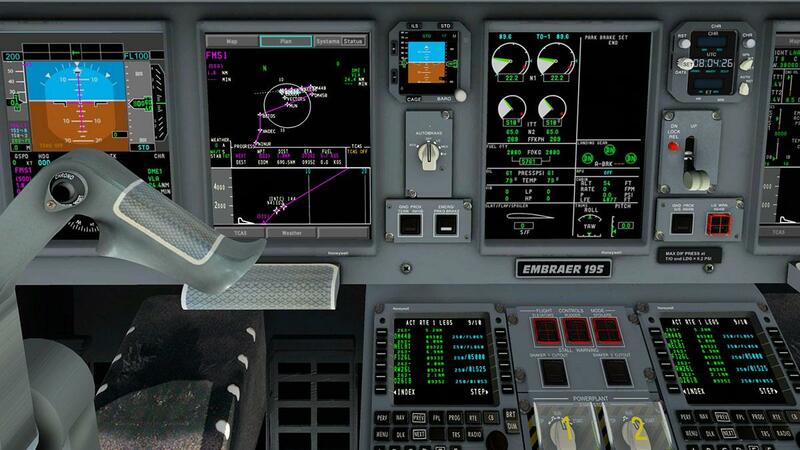 in close consultation with real world E-Jet pilots. Realistic 3D cockpit with high resolution. 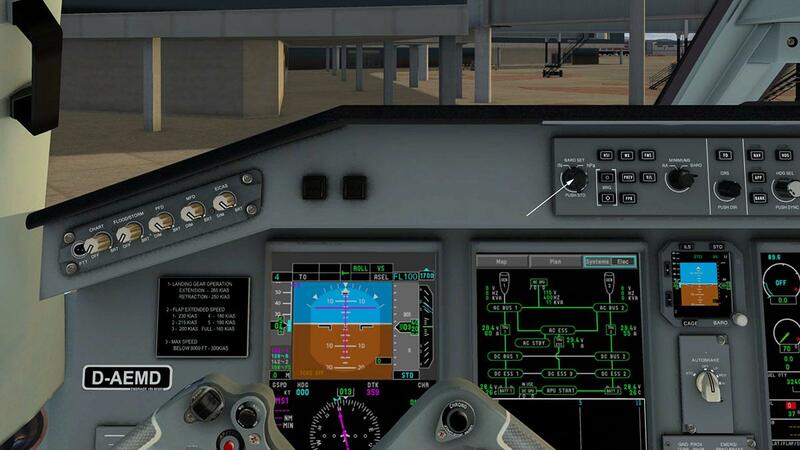 Many systems are implemented with realistic logic, such as electrical, hydraulic, pneumatic, engine fire extinguishing, fuel, wing and engine anti-ice (including automatic mode), communications, and TCAS. 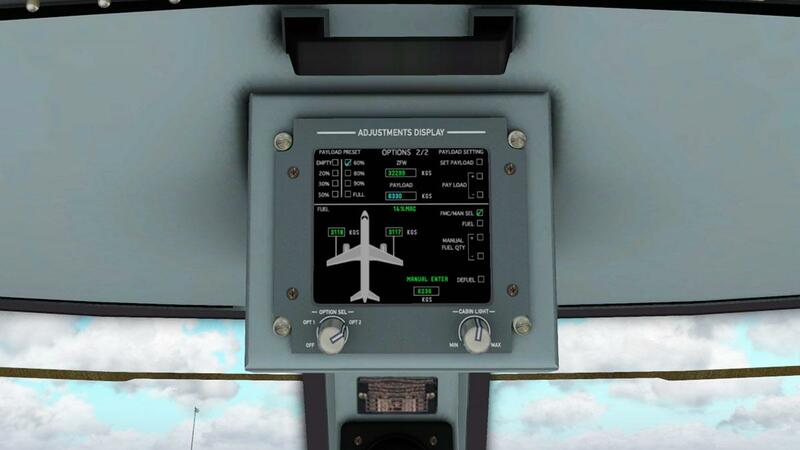 First Officer's MFD display is independent from the Captain's. 3D sounds with DreamEngine plugin. Aircraft comes with a automated X-Updater for direct updates for the life of the X-Plane11 release.